In celebration of the Heart Month of February, a cardiologist has drawn up a checklist of tips on how to achieve the ultimate Valentine’s Day gift to yourself and your loved ones -- a "healthy loving heart". 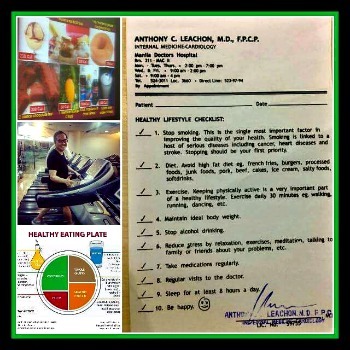 Tired of seeing his patients fail their health goals, Dr. Anthony Leachon, leading internist and cardiologist of the Manila Doctors Hospital and fellow of the Philippine College of Physicians and the American College of Physicians, made a checklist of reminders everyone could follow, not only this month but all year round, for a healthy lifestyle. "A checklist helps a lot. I'm sad seeing patients failing in their health goals," Leachon said, adding that his checklist is for those who have trouble remembering how to lead a healthy life. Giving up smoking tops his list. "This is the single most important factor in improving the quality of your health. Smoking is linked to a lot of serious diseases, including cancer, heart diseases and stroke. Stopping it should be your first priority," he said in the checklist. Diet follows, with an advice to think many times before gorging on french fries, burgers, processed food, junk food, pork, beef, cakes, ice cream, salty food and soft drinks. Leachon emphasized the importance of avoiding a high-fat diet as this leads to excess weight and obesity, which in turn give rise to a host of life-threatening diseases, such as diabetes and hypertension, to name a few. He advised the public to follow the Food Nutrition Research Institute’s (FNRI) healthy eating plate guide, with vegetables and fruits taking up half of the plate (more vegetables than fruits of all colors, actually), whole grains making up a quarter of the plate, and healthy protein the remaining quarter of the plate. Potatoes and french fries do not count as vegetables, according to the guide. Brown rice, whole-wheat bread and whole-grain pasta are whole grains; while white rice and white bread are refined grains, the intake of which must be limited. Healthy proteins are derived from fish, poultry, beans and nuts. Consumption of red meat must be limited while bacon, cold cuts and other processed meat are a no-no. The guide also recommends the use of healthy oils, like olive and canola, for cooking instead of butter, the use of which must be limited to avoid trans fat. Trans fat are notorious for raising the levels of bad (low density lipoprotein or LDL) cholesterol and lowering the good (high density lipoprotein or HDL), leading to heart ailments, stroke and Type 2 diabetes. The guide also recommends drinking water, tea or coffee with little or no sugar. It also advises limiting the intake of milk or other dairy products to 1-2 servings a day; and a small glass of juice a day. Sugary drinks must be avoided. To give an idea of how fatty foods can be, a can of cola (including diet cola) contains 138 calories; a scoop of ice cream, 230 calories; a serving of banana split, 850 calories; a glazed doughnut, 250 calories; a 2-oz. chocolate bar, 300 calories; a medium mango, 80 calories; and a milkshake, 300 calories. Leachon warned that unburned calories become excess body weight, and as such, third on his list is exercise. He said he himself spends one hour on the treadmill, good for burning 600 calories, equivalent to four cups of rice. Eating two chocolate truffles with 200 calories will require 20 minutes of bike exercise while eating a muffin containing 450 calories will need one hour of jogging to burn all those calories. The 650 calories in a slice of pizza can be burned by one hour and 10 minutes of playing tennis. According to the cardiologist, exercise has undeniable effects on one's mood and can help in reducing anxiety. It also does wonders in boosting the immune system, results in better sleep, strengthens the brain, enhances body image and contributes to the feeling of happiness. He further said that 30 minutes of walking, running or dancing are likewise beneficial, along with climbing the stairs instead of taking elevators and escalators, and parking the car at a distance to encourage walking.